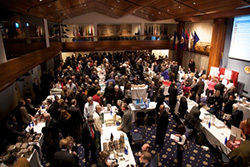 National Press Club Book Fair. I’m honored and excited to be an invited author for the 37th Annual National Press Club Book Fair & Authors’ Night next Tuesday (November 18) in Washington, D.C. There are a lot of famous authors on the list. And one much lesser-known one from Floyd, Virginia. Occasionally, the door cracks open and you get to see what it’s like to be on the inside. The Capitol region’s premiere holiday book event is back for the 37th year! The National Press Club Journalism Institute is once again partnering with landmark local book seller Politics & Prose for a night of pols, pundits and prose. Authors will be on hand to talk to their fans and sign books at this most exciting literary event. Patrons can browse for books at the Club’s headquarters at 529 14th Street NW from 5:30 to 8:30 p.m. Save time and pre-order your tickets below. Tickets will also be available at the door. The Book Fair is a fundraiser for The National Press Club Journalism Institute, a 501 (c) (3) charitable organization, which advances journalistic practice by equipping professionals with the skills and competence to innovate, leveraging emerging trends, recognizing leaders and innovators, and mentoring the next generation of journalism and communications professionals. The Book Fair also supports the Club’s beautifully renovated Eric Friedheim National Journalism Library, which provides research and resources for news professionals.